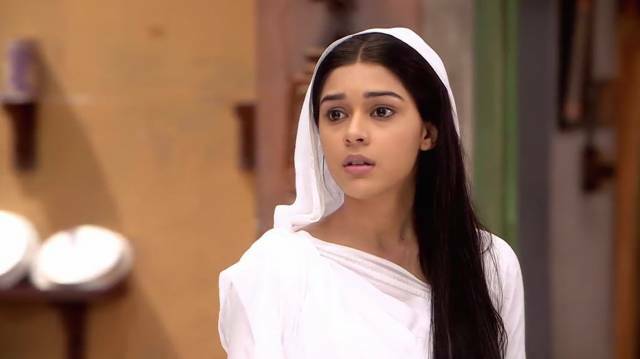 Ishq Ka Rang Safed 12th April 2016: Dhani came to the room. Viplav asked why she bent and apologised to Raja. Dhaani asked him to hear once. Viplav said he wouldn’t accept that behaviour and Raja were acting to be innocent. Dhaani stated that she apologised because she knew that if Raja left, Shalu would have also left the house. Raja heard everything and thought about Dhani’s words. Dhaani told Shalu wouldn’t let Raja come near him. She asked Viplav to cheer up. Raja and Shalu were in the car. Viplav and Dhaani came in. Shalu said that she thought to go out to cheer up. Raja called her Suman and stated that his bhai named her with love. They came to an ice-cream shop, and Raja ordered and bought vanilla ice-cream for Dhani. Viplav asked Dhaani if she would eat pan. Dhaani denied. Raja said not to force him as Suman Bhabhi doesn’t eat pan. Viplav went angrily. Dhaani followed. Dashrath told Kanak that they would eat after kids come. Just then they arrive. Viplav went straight to his room. Dashrath asked Raja reason. Raja replied that he tried to make relations but stopped. Dhaani went to the kitchen. Kanak asked why she came as she told her many times not to enter. Dhani said she made food for mahabhoj, she hadn’t any objections and had equal rights to the kitchen. Viplav heard and took her in the hall and asked not to reply to Kanak if she told anything. Dhani went crying. Viplav followed and locked the door. Kanak tried to hear. Viplav wiped her tears and said that their plan was working. They hugged.